This is a recipe I have been meaning to share on the blog for a long time! I first started developing this recipe before my son William was born. 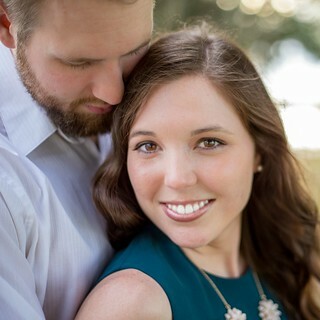 I was in full nesting mode, stocking my pantry and freezer with food so I was prepared for life with a newborn. 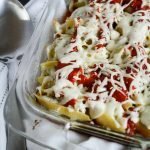 I made a huge batch of these stuffed shells so we could have them for dinner that night and put another pan of them in the freezer for after baby was here. They worked great as a freezer meal! If you want to try that, I included instructions for freezing as well as how to thaw and reheat them in the recipe notes below. 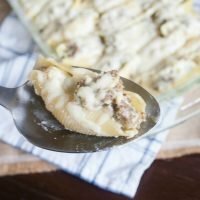 Stuffed shells are one of my favorite comfort foods. I love how easy it is to make them in bulk so you can have leftovers for another day. 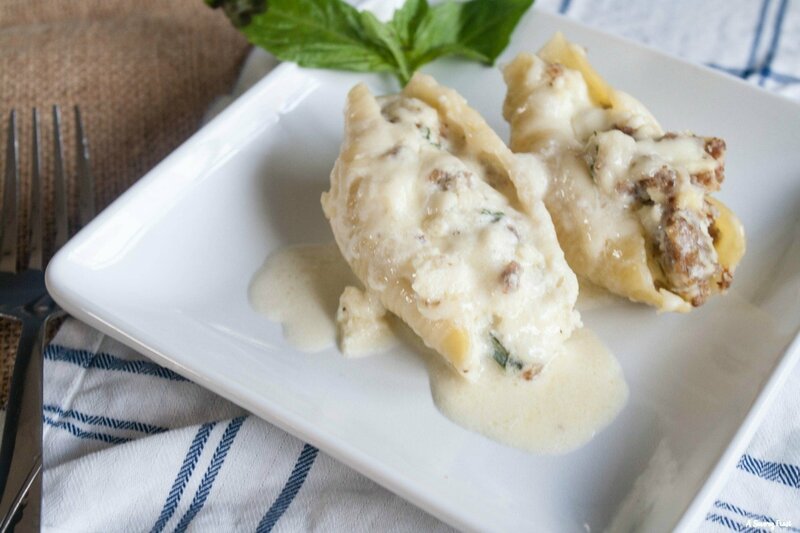 This version combines Italian sausage, a homemade alfredo sauce and lots of cheese into one flavorful dish. 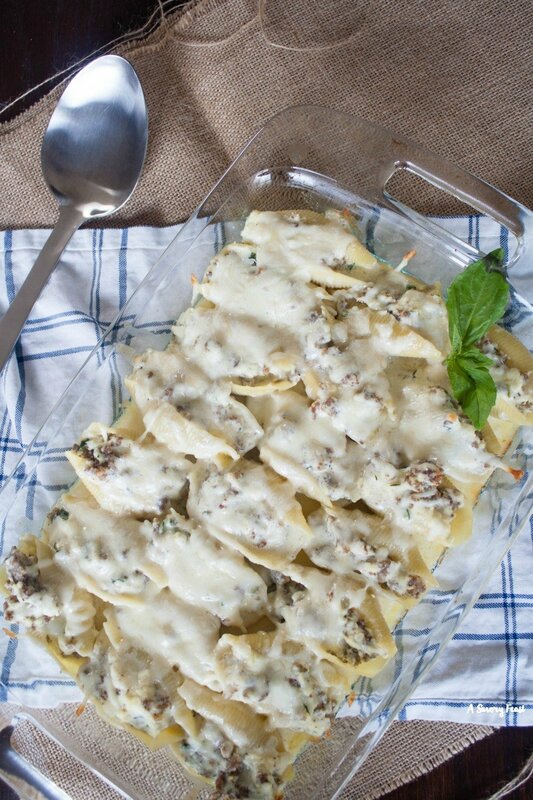 One of the key ingredients in this recipe is the fresh basil. It adds so much flavor and dimension to the dish. 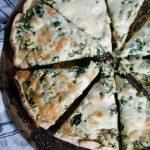 You can use dried basil if you have to, but it really is so much better with fresh basil. 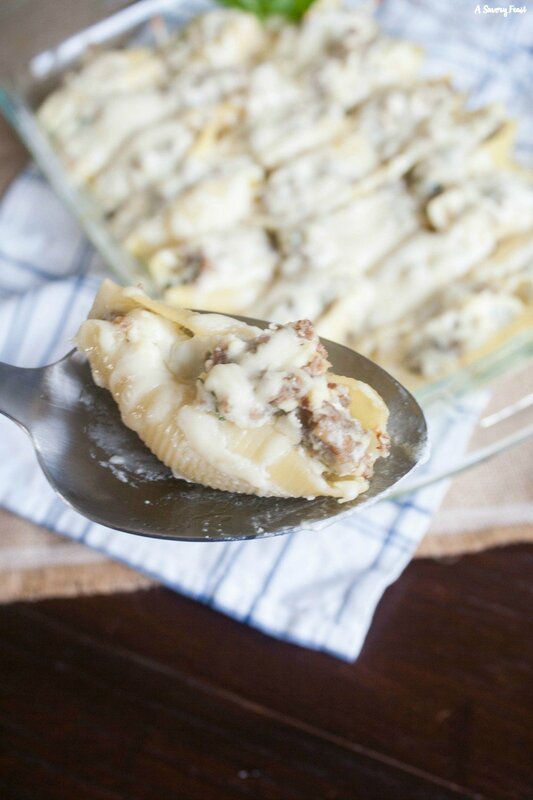 Dish up these delicious Italian Sausage Alfredo Stuffed Shells for dinner tonight! I know they will be a hit at your house, too. 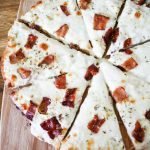 I like to make a double batch of these whenever I make them so we can eat one pan of them that night and freeze the rest for an easy dinner another night. Remove the Italian sausage from the skins and cook in a skillet on medium high until done. Set aside. Boil the pasta shells for about 9 minutes or until almost al dente. Drain the water and lay the shells on a flat surface to dry and cool. In the meantime, melt the butter in a medium saucepan over medium heat. Add cream and bring to a gentle boil. Remove the saucepan from the heat and add in 3/4 cup of the parmesan cheese, stir to combine. Set the sauce aside to thicken. Preheat oven to 350 F. Grease a 9x13 inch baking dish. Spoon about 1/2 of the alfredo sauce into the bottom of the dish. In a small bowl, mix together the remaining parmesan cheese and the mozzarella cheese. Set aside 1/3 cup of the cheese mixture for the topping. Combine the remaining cheese, ricotta cheese, egg, basil, and a dash of salt and pepper. Mix in the Italian sausage. 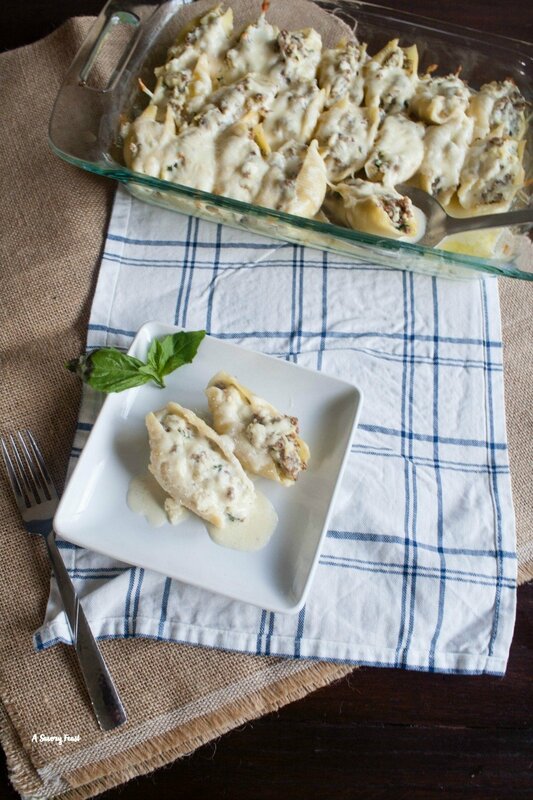 Stuff the shells with the ricotta mixture and arrange in a single layer in the baking dish. 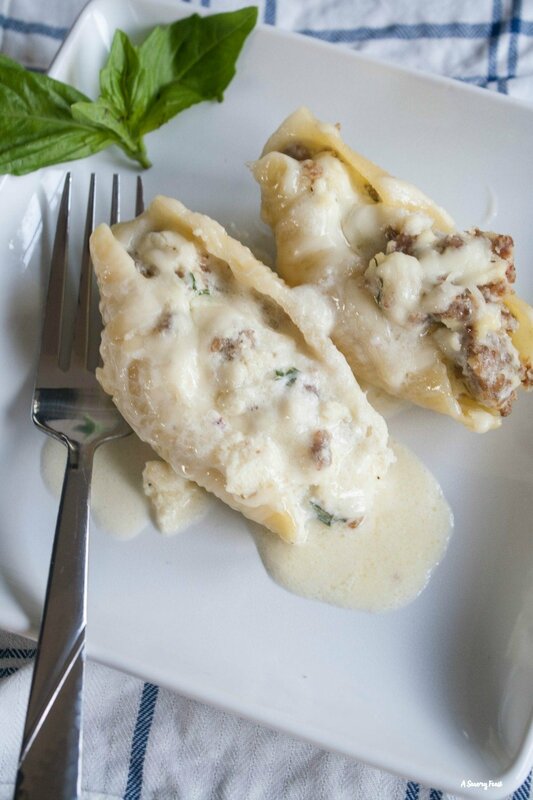 Pour the remaining alfredo sauce over the shells and sprinkle with the 1/3 cup of cheese. Bake for 15-20 minutes or until sauce is bubbly. Sprinkle with basil and serve. You can substitute the fresh basil with dried if necessary, but it really is so much better with fresh! 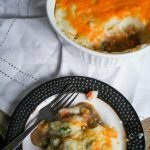 This recipe is great for a freezer meal. Assemble the shells and sauce in a disposable foil pan. Cover with cling wrap and then foil. Freeze for up to a month. When you are ready, thaw the shells overnight in the refrigerator. Preheat oven to 350 and bake for 15-20 minutes or until sauce is bubbly. I have made this dozens of times. Tonight I’m making this recipe quadrupled. Serving it as the MAIN dish at my family reunion tomorrow. I consitantly get compliments about how much everyone loves when I make this. Not mention its husband friendly (no red sauce, no onion, no peppers, no veggies, no mushroom) lol. Thank you so much for sharing. Thank you so much! I am so happy to hear you love this recipe. I hope everyone loved it at your family reunion.